How do we know that our team at International Door Corp has proven expertise in door openers and garage doors in Lewiston, ME? Because of our many years of experience (3 generations for over 50!) selling, installing, maintaining, and repairing complete garage door systems. Be assured that if there is a problem with your garage door, our highly qualified technicians will be able to find its cause and to rapidly provide you with an efficient solution. We are aware of the importance of good customer service, and that’s why we suggest you enroll in a yearly preventive maintenance program to avoid the need of a garage door repair. That way, your garage door system will remain safe and fully operational for a long time. Does your garage door no longer work like it used to? We can help! We are very good at garage door repair. With age, your door may start to experience certain problems. It may no longer close properly or it may stop before it reaches the ground. It may also feel heavy, be difficult to open, or no longer open at all. Are you experiencing a problem with your garage door opener? Does it make loud, unpleasant noises? Does it open and close the door by itself? Is the reverse safety mechanism no longer working? We are experienced in residential, commercial and industrial garage door repair. We serve the Central Maine (Lewiston, Brunswick, New Gloucester, Norway and surroundings). We look forward to serving you! Please see our excellent reviews on Angie’s List! The moving parts of a sectional garage door which are under the most stress when the door is opened and closed are the springs. This is the reason why it is very important to perform regular maintenance on them or to replace them if they are worn. There are two types of spring system: “extension” springs (which must be equipped with safety cables in case they break) and “torsion” springs (safer, more durable, and quieter). The type of spring system is chosen according to the frequency of use expected from the door, its size, and the amount of space available above the door. Does your garage door make unpleasant noises when it opens and closes? They may be caused by broken rollers or misaligned panels (which would cause rubbing on the tracks). It is a serious issue and should not be neglected, because your garage door could come off its tracks and endanger your family. At International Door Corp, our technicians are able to perform this delicate maintenance. They will get your garage door back in shape, perfectly align your system, verify spring tension, and perform the required maintenance and/or garage door repair to make sure it remains in the best possible condition for the age of the door. Note that garage door can derail for other reasons than regular wear and tear. 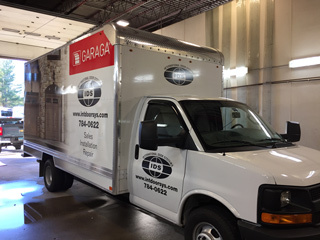 Garaga diligently controls the quality of the materials it uses in its garage door system, ensuring that they meet its high standards. If you purchase your next garage door from us, we guarantee that you will be fully satisfied by the product and by the quality of our garage door repair, garage door service or garage door maintenance services.